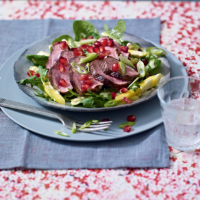 This fresh and aromatic salad is the perfect foil for the rich duck. Quick to make and packed full of flavour, it’s the ideal recipe for a romantic dinner for two. 1. Dust the duck breasts with the spice powder and cook in a griddle pan or non-stick frying pan, skin side down, for 10 minutes. Turn and cook the other side for a further 5 minutes until the duck is crisp and dark golden. Set aside to rest for 5 minutes. 2. Arrange the salad leaves on 2 plates and scatter over the mango pieces. Drizzle lightly with the dressing. 3. Slice the duck and arrange on top of the leaves. Scatter over the pomegranate and salad onions and serve warm. The pomegranate lends a Persian feel to this recipe, so try swapping the Chinese five spice for aromatic and peppery baharat for a Middle Eastern-inspired dish.